Robert Venturi’s New Castle County House offers a modest but instructive example of the Post-Modern style set in rural north Delaware. An influential teacher and theorist, Venturi studied architecture at Princeton University and attended the American Academy in Rome during the mid-1950s, where he developed a “partiality” towards post- Renaissance architecture, particularly works built during the Mannerist and Baroque periods in Italy. 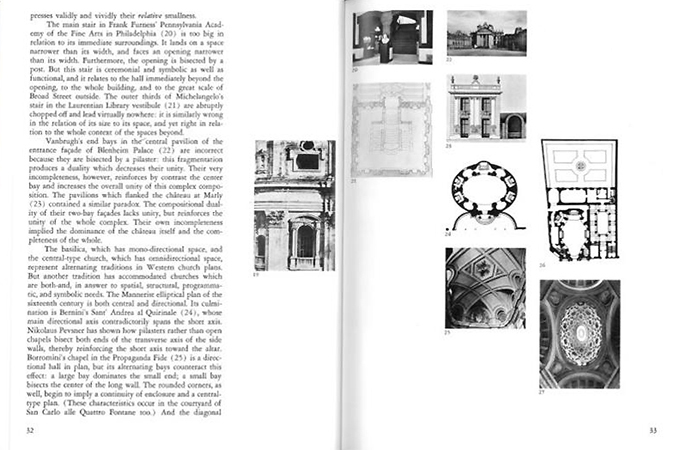 In 1966, The Museum of Modern Art in New York published his first book Complexity and Contradiction in Architecture. 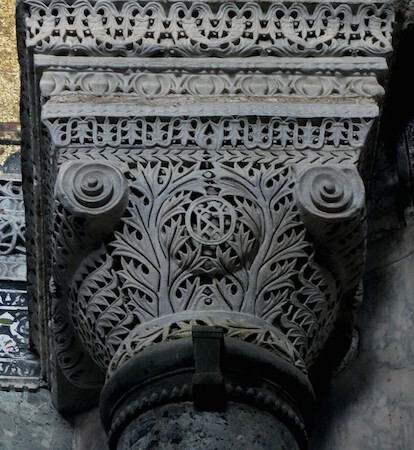 Written while he was teaching at the University of Pennsylvania, it contains dozens of small black-and-white photographs of Western architecture from ancient times to the present day, as well as examples of the architect’s early work. Venturi used the first chapter, sub-titled “A Gentle Manifesto,” to express his strongly held belief that orthodox Modern architecture and city planning had run its course. Rather than continue in the disciplined, austere footsteps of European architects Le Corbusier (below) and Mies van der Rohe, he highlighted historic structures that exhibit a “messy vitality over obvious unity”—seen, for example, in his inclusion of a “contradictory” Byzantine capital from Hagia Sophia in Istanbul. Complexity and Contradiction in Architecture was well-received by contemporary critics, particularly Yale University professor Vincent Scully, who wrote in the introduction that Venturi presented a fresh approach to looking at architecture, preferring complexity and contradiction over abstraction and what Venturi called the “fairy stories” of modernist purity. His follow-up, the marvelously-titled Learning From Las Vegas, co-authored in 1972 with his wife and partner Denise Scott Brown and partner Steven Izenour, highlighted the way buildings are experienced from a distance while traveling along the gaudy Sunset Strip. For Venturi, how buildings look, and are perceived, was far more important than the techniques, systems, and theories used to plan and construct them. The New Castle County House dates to an important period in Venturi’s career and Post Modernism. Though some of his peers designed buildings that respectfully imitate the past, he was no mere revivalist. Rather than copy a specific style, he borrowed freely, juxtaposing, collaging, and reinterpreting forms from distinct periods and places. 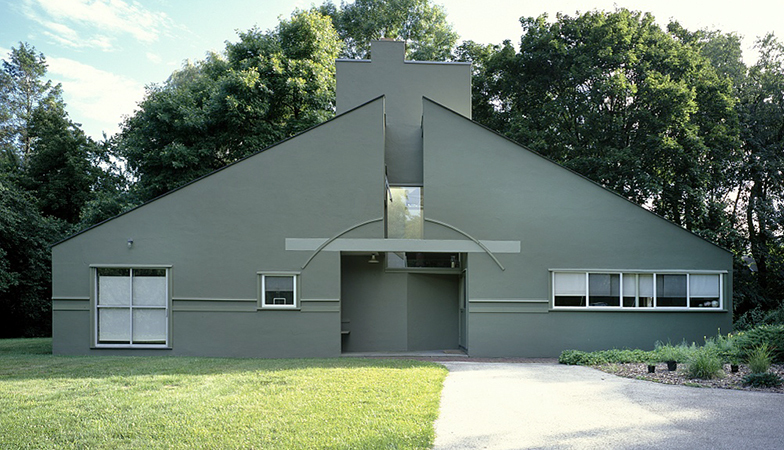 This was particularly true in the Vanna Venturi House (above). Built in the Philadelphia suburbs, this famous house is located at the end of a driveway and resembles a child’s drawing. 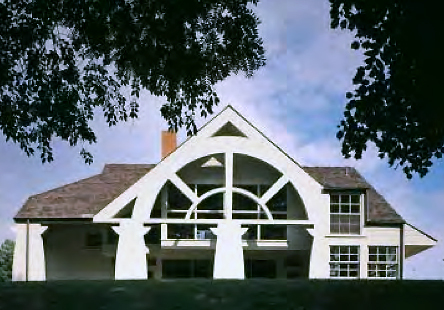 Viewed through the lens of classicism and 1960s Pop Art, his witty design incorporates a large gable, recessed porch, and noticeably off-center chimney. The New Castle County House was built for a family of three and sits comfortably in nature. 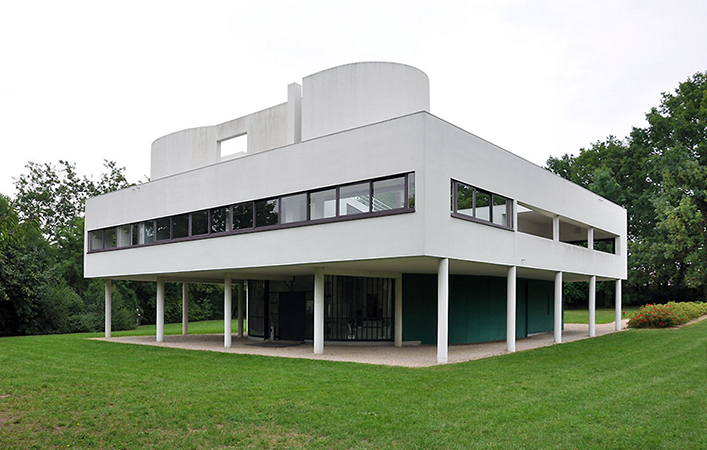 In contrast to Andrea Palladio’s Villa Rotonda or Le Corbusier’s Villa Savoye (above), it neither crowns a hilltop nor hovers above a well-trimmed lawn. Instead, the house sits surrounded by rolling fields, beside a thickly-wooded forest. 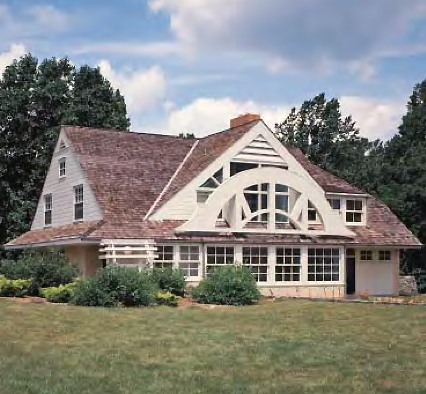 Like many traditional American farmhouses and barns, the painted siding is white and the intersecting gables are clad with unstained wood shingles. It may look conventional and familiar but on closer inspection the exterior is enlivened by a diverse array of mischievous and sometimes perplexing architectural features. Of particular interest is how Venturi treated the “front” and “rear” facades. In Learning from Las Vegas, the authors celebrated the concept of the “decorated shed”– buildings that exploit easily recognizable two-dimensional elements to generate visual interest and meaning. The “front” façade of the New Castle County House incorporates a floating arched screen that, like a highway billboard, rises somewhat awkwardly from the lower edge of the gable (below). 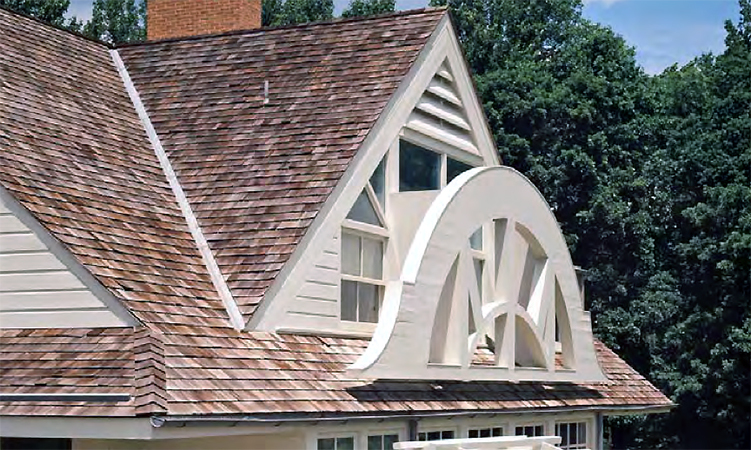 Though Venturi claimed this curved feature had Austrian Baroque origins, like a garden gate or eyebrow dormers found on some Victorian houses, it functions as a sign, identifying the structure as a residence. Furthermore, since the owners enjoyed bird watching it may also have doubled as a blind, camouflaging the large windows behind it. The “rear” facade is even more curious and complex (left). While it, too, is dominated by a prominent arched screen, this screen is framed by the edges of the gabled roof. Supported by what appears to be a Doric colonnade, the four stubby columns are, in fact, almost flat. Thin as the outer walls, these cut-outs carry little weight and enclose the recessed porch. While the column on the far right grows seamlessly out of the adjoining wall, the left column appears split in half by the addition of an aluminum drain pipe. Classical in derivation yet slightly cartoonish, this somewhat awkward assemblage gives the house a simultaneously grand and whimsical appearance. In photographs dating from the time of the building’s completion the spacious interiors appear simple and comfortable, with wood decorations inspired by various 19th century design traditions. 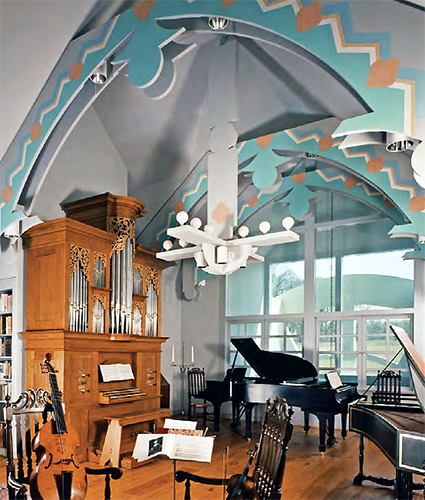 The painted arches in the vaulted music room (below), the quirky chandeliers, and perforated wall patterns exhibit a straight-forward craftsman-like quality, as if cut by hand or jigsaw. Conspicuously two dimensional, their fanciful silhouettes evoke the Carpenter Gothic and Queen Anne styles. Venturi never liked the stylistic term Post Modern, but his buildings and critical writings helped propel late 20th-century architecture in a new direction. This private residence remains a playfully challenging work expressing a refreshingly pluralistic view of architecture and design. Cite this page as: Dr. Matthew A. 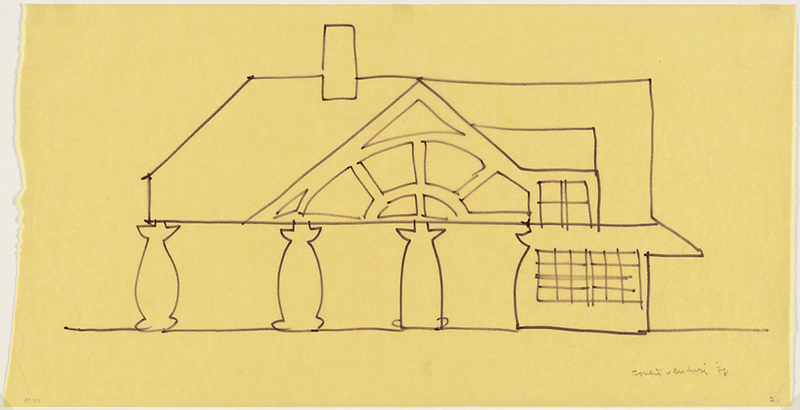 Postal, "Robert Venturi, House in New Castle County, Delaware," in Smarthistory, August 9, 2015, accessed April 23, 2019, https://smarthistory.org/venturi-house-in-new-castle-county-delaware/.